This workshop trains BioSand filter implementers on the necessary components of starting and running their own Biosand filter programme. This 4-5 day workshop provides training in the proper maintenance and use of the BioSand filter, which are vital to the filter’s contribution to its end users’ continued good health. Participants will get hands-on experience in the construction of all filter components—the concrete filter box, media, diffuser plate, and lid—as well as learn the rationale behind the filter’s design, how to install the filter, and how to instruct end users on its correct use and maintenance. While exploring the relationship between water and health in developing countries, participants will gain a fundamental understanding of water, hygiene, sanitation, disease transmission, household water treatment options, and safe water storage, and learn how to successfully plan and implement household water treatment projects. • Individuals and organizations interested in starting a rainwater harvesting program in a developing country, possibly with some background in international development or water management. • Motivated and prepared to implement a household rainwater harvesting program. • Participation by women is encouraged. Preferably, 2 to 5 people from each organization would attend to ensure that they learn together and benefit most from the workshop. • This is an introductory level workshop. It is not intended for current rainwater harvesting practitioners in developing countries or for applications in Zambia. • The participatory workshop includes theory, classroom exercises, demonstrations, open discussion, case studies, and hands-on construction of rainwater harvesting system components. Active participation is encouraged. The following is a provisional list of the topics to be covered. A specific agenda will be developed for each workshop based on the participants’ needs. The Community Health Promoter is a 3-5 day workshop and is essential for the successful implementation of any household water treatment, sanitation, or hygiene project. This course will provide participants with the skills to effectively organize, train and monitor Community Health Promoters as part of a new or existing project. This workshop is highly interactive, introducing numerous learning tools and activities which participants can then apply to train Community Health Promoters. The curriculum reviews the fundamentals of global water issues, water quality, disease transmission, household water treatment, proper hygiene, and basic sanitation, emphasizing behavior change, participatory learning and action tools, facilitation techniques, social marketing, communication methods, and training programs. Participation by women is encouraged. Preferably, 2 to 5 people from each organization would attend to ensure that they learn together and benefit most from the workshop. The workshop includes theory, classroom exercises, demonstrations, role playing, small group work, open discussion, and case studies. Active participant engagement in learning activities is encouraged. All workshop participants will receive reference manual, educational materials, including posters and participatory activities, and a CD containing all material presented in the workshop in addition to related resources. This workshop teaches principles for effective facilitation, including the range of learning styles, training methods, cross-cultural communication, and how the brain works. Participants put their skills to use during the training, giving presentations and receiving peer feedback. This 5 day workshop is designed for people interested in learning how to become an effective trainer to deliver CAWST workshops, and in learning to communicate and train effectively. Topics include how people learn, the role of the trainer, and tools and techniques for designing and conducting participatory lessons. Additional topics such as assessment and evaluation, giving feedback, cross-cultural and cross lingual training, and working with a facilitation team will also be explored. The workshop will incorporate various CAWST training materials into the sessions. • Understand how the brain learns and the learning process. • Explain how adults learn and how to train them. • Demonstrate various methods of participatory learning activities. • Assess participant needs and customize activities/direct discussions to address these needs. • Demonstrate how and when to use a variety of learning materials to add value and flow to the class (audio/visual, case studies, activities, handouts). • Explain and practice the key skills, knowledge and attitude of an effective trainer. • Demonstrate how to communicate effectively (e.g., verbal, non-verbal, active listening, giving instructions, effective questioning, and guiding as training). • Describe how different cultures communicate and educate differently and how to accommodate for these differences. • Demonstrate skills in delivery of content in a cross lingual environment. • Discuss factors involved in finding and working with a translator or an interpreter. • Plan a lesson using a lesson plan that will demonstrate effective facilitation skills, achieve intended objectives, address learning styles and contain participatory activities. • Organize an agenda for a session to practice with flow of topics and training for optimal learning potential. • ·Demonstrate the logistics and administration required to organize a training session and an entire workshop. • Demonstrate how to give clear and useable feedback. • Demonstrate how to assess and evaluate participants, individual sessions and the workshop overall. • Practice self-assessment and goal setting. Throughout the workshop, the theory of learning and effective training skills will be reinforced through the practical use of CAWST training materials. The workshop includes theory, practical components, experiential activities, and open discussion. Active participation is encouraged. All workshop participants will receive a reference manual, and a CD containing all material presented in the workshop in addition to related resources. This workshop teaches implementers the basic principles of rainwater harvesting, the use of water, climate conditions and how to construct a tank using interlocking stabilized soil blocks. By end of workshop a has been constructed. This is a 4 day workshop. Rainwater harvesting is for domestic use is an option worth considering when planning an improved water supply system within a community. Depending on local needs and conditions, rainwater harvesting may provide a supplementary or alternative water supply. The workshop offers instruction on the concept and technology of rainwater harvesting for domestic use, and how it fits into the overall picture of appropriate rural and urban water supply in developing countries. Topics to be addressed include water supply and demand, selection of appropriate rainwater harvesting technology, and the basic construction, installation, operation and maintenance of roof top and surface catchments. Curriculum will focus on recent technologies and current applications. Participants will learn about the fundamentals of water quality, the global impact of clean water, hygiene and sanitation, household water treatment alternatives, social, economic and environmental considerations, and project implementation, all of which are essential background for the correct application of domestic rainwater harvesting systems. All workshop participants will receive a reference manual, a CD containing all material presented in the workshop in addition to related resources, and a copy of the textbook, Rainwater Catchment Systems for Domestic Supply – Design, Construction and Implementation, John Gould and Erik Nissen-Petersen, ITDG Publishing, 1999. Introductory course examining water sources, contamination factors, treatment processes, and storage options in developing nations. Course emphasizes locally appropriate options and implementation strategies. This 1 day workshop is designed for those interested in starting or strengthening household water treatment and safe storage projects in developing countries. It provides an introduction to water sources and contamination, the water treatment process, household water treatment and safe storage options, and criteria for choosing between options. Participants will practice selecting locally appropriate treatment options using the multi-barrier approach for safe water, discuss planning and implementation strategies for successful projects, and observe and practice the correct use of various treatment technologies. This is an introductory level workshop. While participants will observe demonstrations and practice using various technologies, this workshop does not provide full training on the construction of each technology. This participatory style workshop includes theory, classroom exercises, open discussion, case studies, demonstrations, and hands-on practice. Active participation is encouraged. The following is a provisional list of the topics to be covered. A specific agenda will be developed for each workshop based on consultation with the organizer and the participants’ needs. All workshop participants will receive a reference manual and a CD containing all material presented in the workshop in addition to related resources. This 5-day workshop teaches participants the basic principles of water quality and gives hands-on experience for sample collection and physical, chemical, and biological water quality testing. This 4- 5 day workshop is designed for those interested in doing basic water testing as part of the implementation, monitoring or evaluation of household water treatment (HWT) projects in developing countries. In addition to covering basic water testing for physical, chemical and biological contamination, participants will learn about the physical, chemical and biological properties of water, water quality guidelines, testing protocols, data analysis, and preparing water quality testing plans. The workshop will also introduce HWT options as a potential solution to contaminated water. The broader objective of this training module is to enable participants to carry out different water quality tests independently. This is an introductory level workshop. It is not intended for participants already trained in water testing procedures. This participatory workshop includes theory, classroom exercises, demonstrations, open discussion, case studies, and hands-on practice. Approximately two-thirds of the workshop will be spent in practical sessions. Active participation is encouraged. This workshop provides implementers with knowledge of global water and sanitation issues, low cost sanitation technologies, and approaches for implementing sanitation programmes. This is a 3 day workshop. Safe water, hygiene practices, and sanitation are three of the most vital focus areas for improving public health. Extensive research and numerous evaluations have demonstrated that simply improving water supplies may have limited impact on improving people’s health. However, improving sanitation and safely disposing of excreta can have a marked effect, and can reduce incidence of diarrhea by 36% or more. The greatest difference can be made when improvements in sanitation, hygiene practice, and water supply and quality are all combined. A successful sanitation program requires a thorough assessment of the social, cultural, environmental and technological factors that impact the design of the program’s elements. These factors guide the identification and selection of appropriate technology options, promotion approaches, and the actual methods of implementation. The workshop will focus on proven technologies and some recent developments in these areas. • Individuals and organizations interested in starting a low cost sanitation program in a developing country, possibly with some background in international development, public health or water management. 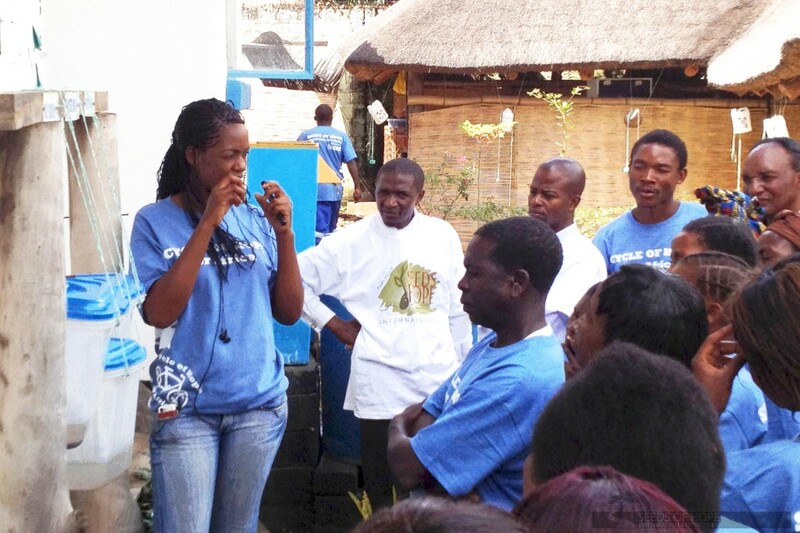 • Motivated and prepared to implement a community based sanitation program. • Excreta management and disposal. • Waste water management and disposal. • Solid waste management and disposal. • Simple methods to control vectors. ◦ Social, cultural and environmental issues. ◦ Promotion and marketing of improved sanitation and practice. ◦ Identification and selection of appropriate technologies. ◦ Construction, installation, operation and maintenance of facilities. This hands-on workshop instructs NGO fieldworkers on best practices regarding monitoring and evaluation of community development projects, using BioSand filter implementation as an example. This is a 4 day workshop. Proper monitoring and evaluation help ensure the success of any project. Ongoing monitoring during a project gives organizers valuable feedback, while an evaluation—a one-time event, usually at the end of a project—looks at how well a project has been executed. Together, these tell an organization whether it is doing the right thing in the right way. This workshop offers instruction on the concepts and methodologies of monitoring and evaluation for household water treatment (HWT) projects. Specific topics to be addressed include the planning cycle, techniques and tools of participatory monitoring, data collection and analysis, and reporting techniques. Participants will share ideas, experiences and acquire skills in the use of various tools for monitoring and evaluation, with a particular focus on the active involvement of beneficiaries in setting up and applying monitoring and evaluation systems. This is an introductory level workshop, designed for middle and senior level project managers, community leaders and volunteers, who are directly or indirectly involved in monitoring and/or evaluating projects or working on HWT projects, or are expected to be engaged in such activities in the future. A variety of learning activities will be used including lectures with Power Point slides, small group work, in-class demonstrations, individual reflection, case studies and open discussion. Active participation is encouraged. Designed to help strategically develop expansion plans, goals, timelines, dissemination models, and future Household Water Treatment projects. This 3-4 day workshop is designed to develop a project plan for the successful start-up, expansion, and replication of a future or existing household water treatment (HWT) project. The curriculum will review the SoHIP dissemination model, introduce key project planning concepts, and teach participants to prepare their own plans, including writing proposals and measuring success. Like all SoHIP workshops, this workshop is highly participatory. The participatory workshop includes theory, classroom exercises, open discussion, case studies, and guest speakers. Active participation is encouraged. • Getting ready: Why are you doing this? ◦ What are you going to do? ◦ Who is doing what? ◦ When will it get done? ◦ How much will it cost? ◦ How will you measure success? ◦ What do you do when things go wrong? This workshop teaches participants the basic principles of water quality and gives hands-on experience for sample collection and physical, chemical, and biological water quality testing. This 3- 4 day workshop is designed for those interested in doing basic water testing as part of the implementation, monitoring or evaluation of household water treatment (HWT) projects in developing countries. In addition to covering basic water testing for physical, chemical and biological contamination, participants will learn about the physical, chemical and biological properties of water, water quality guidelines, testing protocols, data analysis, and preparing water quality testing plans. The workshop will also introduce HWT options as a potential solution to contaminated water. This participatory workshop includes theory, classroom exercises, demonstrations, open discussion, case studies, and hands-on practice. Project Consultation: SoHIP’s International Services team provides support in program development, troubleshooting, network building and project management. Network Building: SoHIP advises, learns from, and stays connected with its clients worldwide, primarily through online forums, in order to share knowledge and best practices from water and sanitation programs around the world. For more information or to sign up for a training, please contact SoHIP.